If you're always having trouble holding onto the base of your model with one hand while you paint with the other... try this out. 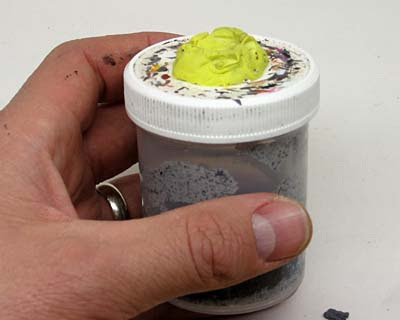 Grab an old paint pot or similar sized object and set a blob of "ticky-tack" (the stuff you use to hold up posters) or something similar on top. Press your model down into carefully and you're all set. Now you can easily hold onto the object and not worry about messing up your model with messy fingerprints. I've seen this tip float about before and I'm not sure why I've not done it before. I am going to make it a point to try this out on my next infantry sized model. Though I'm not sure my minis will have the same character without a little carpet fuzz stuck to them from being dropped during painting? The bluetac usually doesn't hold very well for me, so I quit doing it. Now, I use the gale force 9 magnetic bases, or glue magnets to the GW bases instead. Since I'm using the magnets, what I did was order some large (1/4") magnets, and put those on the inside of small medicine/measuring cups. (like these: http://spectrumadvertising.com/item_information.cfm?SupplierItemGUID=DF51D859-DDB0-4EF3-9C3C-83A2277708CD). It works way better than sticky tack ever worked for me. Mike and Jeanine: I've gone down the magnet route once. I found that with magnets in the bases of my guys, they wanted to all jump together when they were set too close too each other. Sometimes with bigger models or all metal ones, I need to be careful with the bluetac holding them in place while I paint. I just end up checking them a little more frequently than I do my plastic models to make sure they aren't coming off. I use old prescription bottles and bluetac and it works great. No more hand cramps from trying to hold on to an old paint pot, and the varying sizes can be used to match up to the base size pretty well. It certainly beats trying to hold on to a model by the base alone! Like others, I use corks purchased from the local hardware store and yellow tac. I just glue the base to an empty paint pot. Then I remove the mini from the base, and put it on a scenic one that is painted separately. DK: I've seen others do that as well. I like the tacky method, but find it can be problematic with larger, heavier models though. I've tried this, but somehow I always end up moving the model too quickly and watching it go sailing across the room because the tack didn't hold. And that tends to be hard on the models, so I gave up the practice. I also frequently hold the model upside down while painting the undersides of things, and with a metal model that can be enough weight to pull it free. Gailbraithe: True, larger models and heavier ones mean you have to be careful. I have a huge blob of tacky stuff so I don't have than many issues. Dreadnoughts are the ones I need to be real careful with though. I drill a hole into the feet of all of my models, to prepare them for pinning to their bases. I use that pin in a pin vise to hold the model. It lets me paint in any orientation, works well with heavy models (I'm looking at you, Contemptor Dreadnought....) and is a step I have to do anyway, so it works well for me. Brad: I've started gluing my to a spare base with a tiny drop of glue so I can hold them. THen I break them off the base and glue them onto thier final base when I'm done.